Bringing back the Liberal Government will have adverse effects to Sydney's infrastructure and cultural landmarks, writes Ross Jones. POOR OLD SCOMO. Not only is he a happy-clapping tongue twister, which would be curse enough, but now he is apparently a potential apocalyptic nightmare for a NSW Coalition Government due to face the voters next March. Anxious NSW Liberals fear their federal colleagues are “poisoning” their brand and could cost them the state election if they fail to shake all association with the Morrison Government. New polling for the Herald shows that Labor leads the Coalition 51 to 49 on a two-party preferred basis, with the internal federal Liberal chaos impacting how people will vote in NSW. The Feds wouldn’t help, of course, but the Berejiklian Government is perfectly able to lose the upcoming March election all by itself. In fact, it is poised to do just that. For starters, the Government is heavily Sydney-centric, committing massive amounts of windfall stamp duty receipts on infrastructure projects nobody really wants and which have caused Sydney residents massive inconvenience. From WestConnex, which has destroyed suburbs and ruined people’s lives and still is nowhere near completion, to the light rail which has eaten some of Sydney’s most magnificent trees while at the same time destroying the livelihood of traders unfortunate enough to be on the route of this unfinished monstrosity, to infrastructure needed to accommodate the new single deck train which no one needed and is made in China and not Newcastle, the list of abominations goes on. And all these projects are in a mess. Way behind schedule, way over budget and with a good helping of litigation thrown in. The New South Wales Government has been hit with another lawsuit over its troubled delivery of the Sydney Light Rail project, with a second contractor suing for millions of dollars over a contract dispute. A fortnight ago, it also emerged that a contractor engaged to build the M5 tunnels as part of the second stage of WestConnex was also seeking up to $700 million from the Government. The Minister for WestConnex, Stuart Ayres, said that he still hoped that dispute could be resolved. Truth is, the current NSW Government could not organise a piss-up in a brewery, as they say. This is not Morrison’s fault. Sydneysiders have been living in a city that has been turned into one giant construction site, with a carpark meandering through the debris like a sclerotic river. 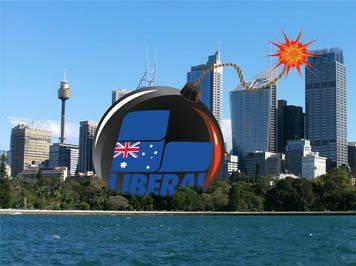 The Liberals are now desperate to pull down both the city’s major sporting venues at the same time and replace them with very expensive buildings — so expensive you could build a few hospitals for the money. Given this government’s ability to actually deliver, if it goes ahead with this folly expect to see your next footy game in about 2030. And Gladys has another surprise planned for us if we are stupid enough to re-elect her and her cronies. The destruction of La Perouse. After a shattering voyage, the First fleet assembled under the north headland of Botany Bay, their original destination, on 24 January 1788. That’s where Phillip had his brush with Comte La Perouse, after whom the bayside suburb is named. The area is seriously picturesque, with natural bush, Congwong and Little Congwong beaches and, of course, Bare Island, with its 1889 fort designed to repel the Russians should they try it on. Naturally, as this is Sydney, the fort’s construction was a corrupt rort and it ended up a substandard facility which would have killed everyone inside if struck by one of the Tsar’s canons. There was a Royal Commission of enquiry. Although the existing Port Botany container terminal is a massive thing, it’s around a headland – Molineaux Pt – from the beaches at Frenchman’s Bay and Yarra Bay. The terminal is hidden from sight and could be ignored if not for the freighters making their way through the heads. The area is a special place for many First Nation people. The connection that Aboriginal people living at La Perouse have with the land has not faded. Their stories provide a rich and diverse history of La Perouse and are testament to the cultural continuity of the Aboriginal community. You can even do a rock art tour. It meets at The Snake Pit, Cann Park, end of Anzac Parade, La Perouse. The NSW Coalition has now decided it wants to build an international cruise ship terminal at La Perouse, either in Yarra Bay or on Molineaux Point. The rest of La Perouse will then be upgraded to a car park, concrete bollards and a freeway to the city. To hell with people who live in Sydney, the NSW Government needs cruise liner capability here in case it misses out on all those tourist dollars pouring into crony pockets. La Perouse and its environs will be no more. If Port Botany is an option, let's get on with it. This is an industry that pours billions of dollars into the Australian economy every year, bringing visitors from all over the world… and that visitor experience to date has begun with a colourful Sydney Harbour arrival. Failure to find the right solution in Sydney also has ramifications for our near Pacific neighbours who will also miss out on cruise traffic if Sydney loses its lustre as a cruise hub. Sydney would lose more than its lustre as a cruise hub if these cretins get their way. Now step outside the concrete jungle of Sydney. The level of environmental vandalism under this government is staggering. There is no doubt the coalition is struggling in regional NSW. The Libs had held Wagga Wagga since 1957, but their contender, Julie Ham, was trounced in the September 2018 by-election by independent Joe McGirr. ‘The Liberal Party has held the safe Riverina seat for about six decades since winning it in a by-election in 1957, before it was vacated by disgraced MP Daryl Maguire. A little over two years ago, the Nationals lost Orange, a seat held since 1947, to the formerly fringe Shooters Fishers and Farmers party. The recent improvement in Labor’s polling numbers is coincidental with the installation of Michael Daley as leader. Daley has just a few short hot summer months to make an impression on distracted NSW voters. He’s got a lot of targets to go for but will anyone be listening? Will The Daily Tele and Ray Hadley give him a fair go? The last time a NSW Coalition Government won a third term in office was Sir Robert Askin in 1971. Sydney bureau chief Ross Jones is a licensed private enquiry agent the author of 'Ashbygate: The Plot to Destroy Australia's Speaker'. You can follow Ross on Twitter @RPZJones.